M&A has never been as important as it is now. 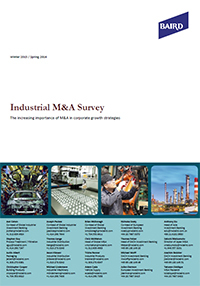 Industrial corporates are focused on maximizing their growth in the current low growth environment and using strategic M&A to accelerate growth and create value for shareholders. Additionally, the survey revealed that the desire to provide one-stop-shop solutions, often including both products and services, to customers on a global basis is driving consolidation in the industrial sector. These acquisitions can complement existing product lines, allow entry into additional product categories and end markets, or provide industrial technologies that are patented or costly and time consuming to develop in-house. More corporates are investing in new technologies, reorganizing their manufacturing footprint and providing complete lifecycle support for their customers, using strategic M&A to accelerate achievement of their long-term objectives and create value for shareholders. Learn more about Baird’s Global Industrial platform.